Millions of people around the world mourn the death and celebrate the life of President Nelson Mandela, boxer, lawyer, anti-apartheid activist, political prisoner, peacemaker, statesman and internationally recognized symbol of hope, perseverance and forgiveness. His loss resonates strongly with the staff of the William Winter Institute for Racial Reconciliation and others who work for racial reconciliation and equity in Mississippi. For us, President Mandela was proof of what could be done and how it should be approached. While there are obvious similarities between apartheid and the long fight to end it in South Africa and the system of segregation and the black struggle for freedom in our country, there are deeper, often overlooked links between Mississippi and South Africa. Researchers in South Africa have discovered evidence of visits to Mississippi segregationists by the architects of apartheid, seeking to learn how to create legal structures to subjugate an entire group of people based on skin color. And even as the human body creates antibodies to fight infection, so too did each society generate activists, freedom fighters and, eventually, healing practitioners and scholars. Over the years, scholars from both sites of conflict have recognized these connections. They have shared ideas and learned from one other in the project of reconciliation and justice. Clinical psychologists Garth Stevens and Norman Duncan, professors at the University of the Wittswaterrand in Johannesburg, visited the University of Mississippi in 2001, presenting on their new research on the “everydayness” of apartheid. This research looked beyond the more well-known incidents of state-sponsored violence and the imprisonment of key anti-apartheid leaders, focusing instead on the myriad quotidian ways that individuals in South African society enforced separation and oppression. They looked at direct actions of those who benefited from apartheid, as well as the actions of passive bystanders who refused to challenge the immoral structures. Both Stevens and Duncan had been anti-apartheid activists as teenagers and young adults, and were deeply influenced by Mandela, Steve Biko and other anti-apartheid leaders. From these scholars, the Winter Institute staff learned to search for these patterns of everyday racism in Mississippi. In 2009, Pumla Gobodo-Madikizela, clinical psychologist, author, professor and member of the South African Truth and Reconciliation Commission, invited the Winter Institute staff to an international conference at the University of Cape Town to share its work in Mississippi building bridges between previously divided populations in the state to seek positive social change. Our two institutions deepened our ties, sharing research and strategies for overcoming racial hierarchy. We met Archbishop Desmond Tutu and others who continued to work hard for a new South Africa. The archbishop later recorded a message of encouragement to the community members participating in the Mississippi Truth Project. During that visit, we visited Robben Island, where Mandela had been imprisoned for 18 of his 27 years in jail. We saw the limestone quarry where prisoners spent backbreaking, brutal hours breaking rocks with sledgehammers beneath the blazing African sun, squinting against the glare from the white rocks and choking on the dust, work that would affect Mandela’s eyesight and create lung ailments that would plague him the rest of his life. We viewed the shallow cave in the rear wall of the horseshoe-shaped pit where Mandela and his fellow prisoners would take a brief respite to eat their meager lunch and to plan the future democratic nation; indeed, it was called “the university” of the future country. 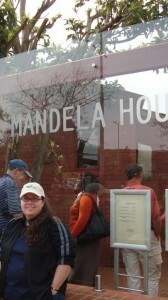 We saw the cell where Mandela was held. It is difficult to view the 8-by-7-foot cell, to learn of the rigid enforcement of rules in the prison and not be transformed by the power of his example upon his release, by the forgiveness and compassion that Mandela bestowed upon his captors and those who maintained apartheid. Mandela voluntarily left the presidency after one term, defying expectations of creating a presidency around a personality. He easily could have done so. Instead, he stepped aside, following the values of democracy, freedom, truth and justice. He called on all South Africans to be leaders, to reach out to their enemies, to seek positive social change, and by his example challenged the world to do the same. Storey was also an architect of South Africa’s Truth and Reconciliation Commission. We queried him about that experience and its lessons for our own Mississippi Truth Project initiative. Storey instructed us to be as local as possible in our work. “Many think that the TRC failed South Africa, but South Africa failed the TRC,” he said. Storey explained that the work of the commission, its seeking of truth and administering of justice, was never brought to the community level. We returned renewed and inspired. In the fall of 2012, we returned to South Africa, this time visiting Johannesburg, including Soweto, the township where Mandela and Tutu lived and where in 1976, apartheid government forces killed nonviolent student protesters, finally bringing the attention of the West to the abuses of the all-white system. The think tank of the institute, composed of activists and scholars from around the world, joined us in Cape Town, where we shared approaches to reconciliation and justice work from South Africa, Northern Ireland and the United States, exploring the creation of a global effort for historical dialogue and accountability, work in which we are engaged. Mandela’s example continued to inspire us and on a second trip to Robben Island with our think tank members, we saw again the transformative power of his example. We helped to bring Storey and his wife, Elizabeth, to Oxford earlier this year, to challenge the community to work more intently, to examine its history more honestly, to continue the work of ending discrimination based on difference. Storey met privately with our entire team, learning more about our work and sharing more lessons from his own work. Since Mandela’s passing this past Thursday, our team has been in touch with our friends there. Storey has reminded us to be careful of those who would deify Mandela, urging all of us to continue the work and reminding us that it will take all of us to ensure progress. Mandela, more than most, looked to others to share leadership. He understood the power of unifying symbols, but he also knew that we all have to roll up our sleeves and do the hard work of building a nonracial world. Mandela served only one term as president so that others could lead. He had every justification for eradicating whites, but instead extended the hand of friendship. He never gave up the demand for full equality in exchange for an easy and limited “unity”; he urged people to work for positive, equitable change. This work, the work that Mandela and so many others have devoted their lives too, is not done. The best way to honor his sacrifices, his vision and his life is to keep doing the work of ending all hierarchy. Susan Glisson is executive director of the William Winter Institute for Racial Reconciliation at the University of Mississippi and has met with many of Mandela’s colleagues in South Africa during the course of her work and research. She earned bachelor’s degrees in religion and in history from Mercer University, a master’s degree in Southern studies from the University of Mississippi and a Ph.D. in American studies from the College of William and Mary. Glisson specializes in the history of race and religion in the United States, especially in the black struggle for freedom, and she has visited South Africa a number of times to build connections between that country and Mississippi. Glisson is the co-author (with Sam Chaltain and Charles Haynes) of First Freedoms: A Documentary History of First Amendment Rights in America (2006), and she edited The Human Tradition in the Civil Rights Movement (2006). She is a contributor to Telling Stories That Change the World (2008) and to the Encyclopedia of U.S. Labor and Working Class History (2006). Charles H. Tucker, a Cary, Miss., native, is the Institute’s Associate Director. He holds a degree in mass communication and journalism from Jackson State University. Tucker was a newspaper reporter and photographer and a writer for the Associated Press. He has worked in development for the Piney Woods School, where he also tutored and taught creative writing seminars. He served in the Office of Public Information at Jackson State University. Most recently, Tucker was the public information officer for the W.K. Kellogg Foundation on its Mid-South Delta Initiative. He is a facilitator and community builder for the Welcome Table model and helps develop and coordinate the Institute’s national and international partnerships. Tucker is a National Book Foundation Summer Fellow and was a Solstice Summer creative writing program participant at Pine Manor College.